Help me raise $500 for the homeless through the charity Back on My Feet. I have been logging my caloric intake and burn for 24 days now, and I have found success, both in achieving predicted weight loss, as well as changing many of my habits. It is important to note, that although Day 1 was meant to be a baseline to reflect my usual habits prior to training, I was already substituting soda with orange juice. Regardless, I have since replaced most juices with water. I’ll have an orange juice once or twice a week, just for variety, but I focus primarily on fruits and vegetables for those nutrients. 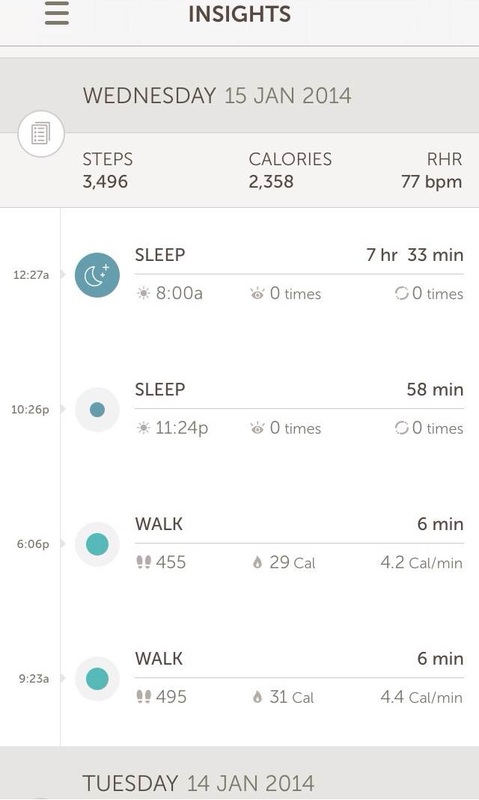 Regarding the differences, I would not put too much stock into the heart rate from Day 1, as it was the first day after a full charge of my Basis B1 watch that I began wearing the device. It, for the first few days fluctuated around 68bpm, before landing in the 50’s. As you can see, I do go over my “target” as this target is mainly what I would eat if I am completely sedentary. In such an instance as Wednesday (Day 22), if I see that I will approach around a 3,000 calorie burn, I tend to up my caloric intake to make sure I’m not overdoing it. If anything, I think I under ate yesterday, given the amount of exercise I undertook. In terms of overall caloric expenditure, my total net calories by the end of tonight (since Day 1 on January 15) will be a deficit just around 29,300 (I will not know until tomorrow morning the exact figure), which amounts to just over eight pounds lost over the 24 day period. Generally accepted thought is that you should lose no more than two pounds a week, which I am on track to do, given this information. The “Don’t Be a Sitter” habit is pretty cool, as it keeps you aware of the very real dangers from being stationary at your desk for too long. “Torch More Calories” may be at a point now where I up the total calories I need to hit, although I want to be careful in that I do not inadvertently overdo it. In conjunction with that habit, I am debating raising my “Step It Up” habit to 10,000 steps, which is generally recommended. 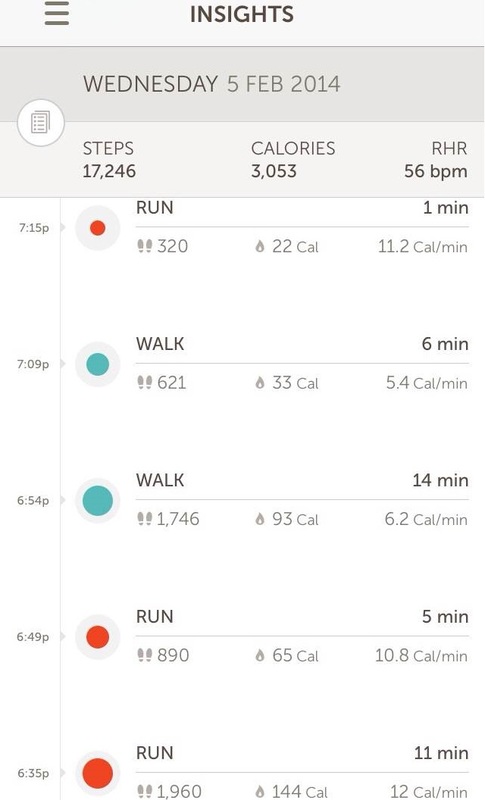 I have been hitting that number without much difficulty, but as you could see above, my norm prior to this fitness plan was something around 4,000 steps a day. So in general, things that used to be more difficult and work have become much less difficult and almost subconscious. 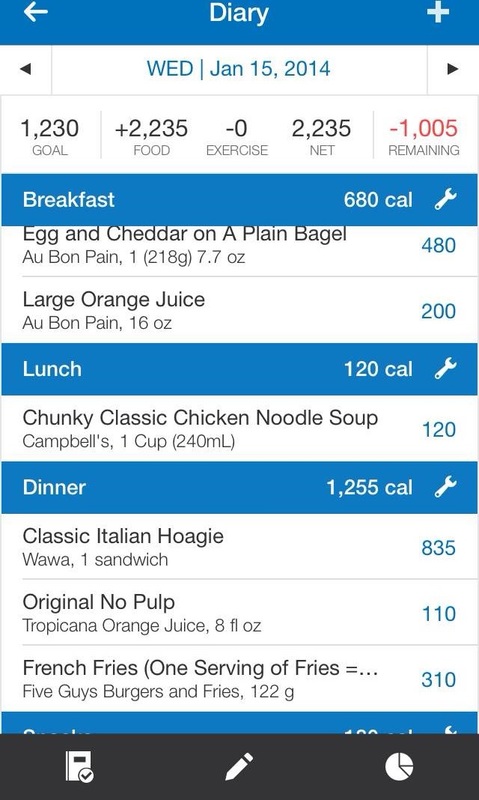 I now only go to places I can correctly count the calories (and their makeup), so I have moved away from some of the more generous portions at say a Coventry and to specifically light sandwiches at Potbelly’s (Skinny Hammy) or Au Bon Pain (this can be deceptively hard, given most of their menu is over 500 calories a serving). The walk time also helps, and I do my best to take a few minutes away from the desk to eat the lunch. The makeup of the foods I eat also is less glamorous: Day 22 I had two burger patties & ketchup via the George Foreman Grill. Sometimes, I will include a Lean Cuisine in addition. 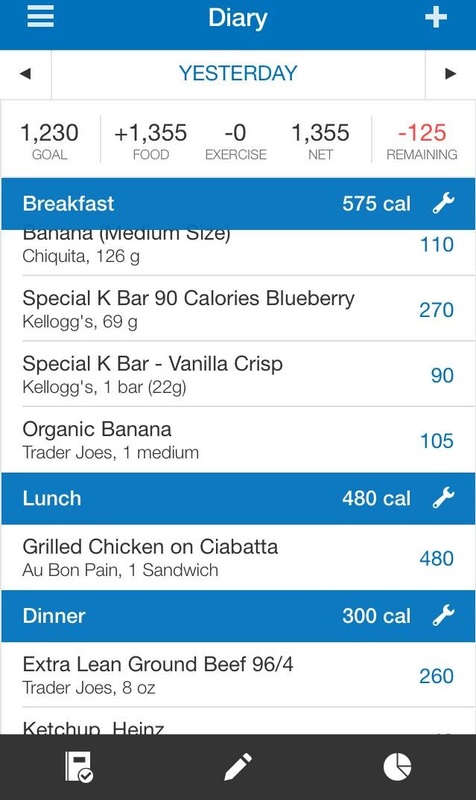 That night (#22), I had a banana at the very end of the night before going to sleep, as I was still hungry (I listed it as breakfast so the whole meal would be captured, as snacks is a separate line that will make the list longer than what I was able to screen grab). I know not all of this is achievable when traveling. I specifically remember the stories of five consultants squeezing into a ford focus to go to a lunch spot to pick up, haphazardly, and go, only to stuff our faces in an absolute rush while working. I’m lucky now to have a good team that respects and trusts that the work can get done without an absolute abandonment of healthy habits. My hope is that I can get enough habits going and potentially enough time at home to do so, prior to having to get back on the road. We’ll see how that goes.